The Visible Infrared Imager Radiometer Suite will monitor the planet's environment, exposing long-term patterns helpful in assessing the impact of climate change. 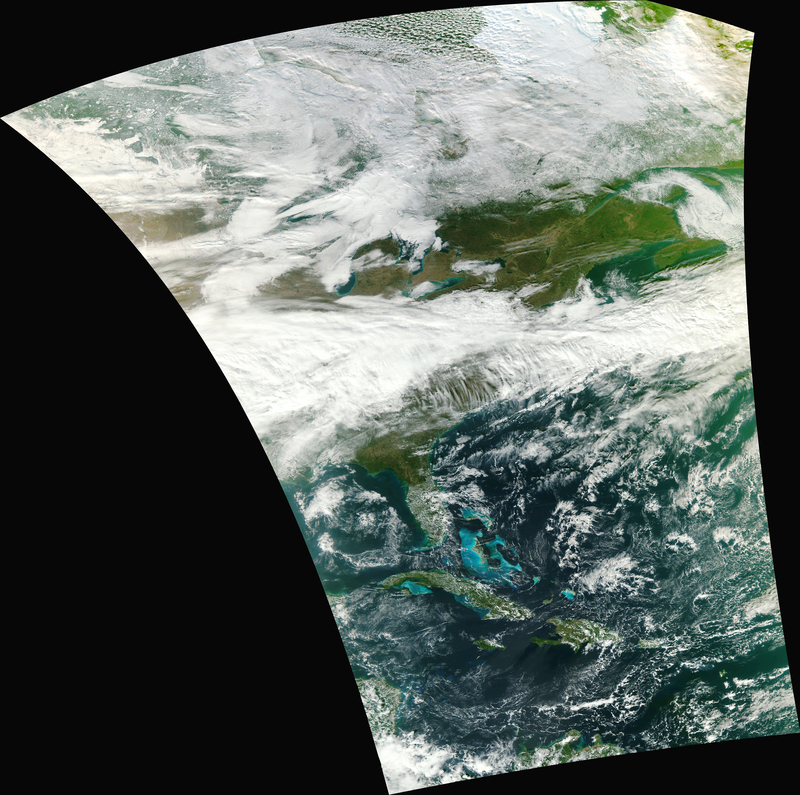 The Visible Infrared Imager Radiometer Suite, or VIIRS, onboard NASA's newest Earth-observing satellite acquired its first image this week, a stunning view of Eastern North America from Canada's Hudson Bay past Florida to the northern coast of Venezuela. The low-Earth orbit satellite known as NPP carries five instruments as it travels at 16,640mph at an altitude of 512 miles. It was launched October 29 from Vandenberg Air Force base in California on a mission to observe Earth's environment and climate. NASA says the tools aboard the NPP will be used in monitoring that planet's environment, exposing long-term patterns helpful in assessing the impact of climate change as well as providing data that will be used by meteorologists for weather forecasting. VIIRS will collect radiometric imagery in visible and infrared wavelengths of the Earth's land, atmosphere, and oceans. Using data collected from 22 channels across the electromagnetic spectrum, VIIRS will be used to study the state of Earth's surface including fires, ice, ocean color, vegetation, clouds, and land and sea surface temperatures, building on ongoing government climate data collection programs that began more than 25 years ago. These zoomed images are portions of the larger image which was taken on Monday. This image of the Caribbean shows Honduras' Reserva Biologica Rio Platano and Parque National Kruta and Nicaragua's Reserva Natural Cabo Viejo Tela Sulumas.